How do I sign up for myCellcom? Simply go to my.cellcom.com, click on Register Now and follow the prompts to complete registration. To ensure the security of your account information, if you are registering as an Account Owner, your password will be immediately sent via text message or mailed to your Cellcom billing address within three business days. Wireless Users have the option to have the password either mailed or immediately text messaged to their wireless phone. What are Account Owners and Wireless Users? When signing up for myCellcom at my.cellcom.com, you need to register as either an Account Owner or Wireless User. Depending on which one you choose, determines the information you will be able to access on myCellcom. Can I register as both a Wireless User and an Account Owner? No. Currently you cannot register as both a Wireless User and an Account Owner. It is asking for an account password. How do I get one? An account password may only be added by the person financially responsible for the account. To establish an account password, they may stop at any local Cellcom store or agent location and show a government-issued photo ID. Or, they can call Customer Care at (800) 236-0055 to request a password form be sent by mail. You may also set up an Account Owner login by entering the last 4 of the Social Security or Federal Tax ID. How do I check how many minutes I have used? 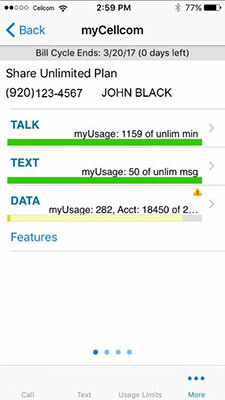 The landing page and myUsage section of myCellcom will both display your minutes, messages, and data used since the close of your last billing cycle. Wireless Users may view the usage for their line of service, while Account Owners may view usage for any line on the account. Under myUsage, my plan minutes do not match what is included with my calling plan. Why? Plan Minutes will show the number of free minutes available with your plan. If you have added a feature to increase the plan minutes that came with your plan, the Plan Minutes will reflect that feature. 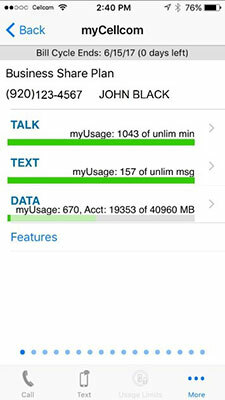 For example, a person on the US America plan adds the Unlimited Cellcom-to-Cellcom feature; the Cellcom-to-Cellcom plan minutes will show as unlimited. I am an add-a-line on a MobileTies or USAmerica(or other non-Share plan). Why does it say I have 0 plan minutes? All add-a-lines will show '0' plan minutes available unless you have added a feature, such as Free Incoming to your line. This is because you share the unused minutes with the primary line on your account. What is the myCellcom app? What devices and operating systems are compatible with the myCellcom app? The myCellcom app is available on smartphones with Android and iOS operating systems. Apple devices — Available on iOS 8.0 and above. Android devices — Available on OS 4.0.3 and above. Where do I go to download the myCellcom app? You can download the app by clicking here and choosing which operating system you have (Android or iOS) to download. Is there a charge for the myCellcom app? No, this app is free to Cellcom subscribers. To get into the myCellcom app, I need to enter my wireless number and password. Where do I get that? To use the myCellcom app, you need to have a myCellcom account set up. To register for a free myCellcom account, simply go to http://my.cellcom.com. Select the Click to Register link below the login button and follow the prompts to complete registration. You can also register for an account on the myCellcom App by tapping on "Sign up". To sign up as an Account User with full access, you will need your account password, Social Security Number or Federal Tax ID. An account password can be added at any Cellcom retail store, or by calling Customer Care at 800-236-0055. You can also choose to sign up as a Wireless User without an account password. A Wireless User account has limited access. How do I view my usage on the myCellcom app? Select the myCellcom app icon on your device. It will take you to the main menu screen of the plan and line you logged in under. To view all rate plans on the account, go to the Main Menu Screen. Here you will be able to see all the plans on the account. You are able to tap on the plan to view the MDNs on each. There is an "All Plans/All Lines" option that displays all lines on all plans (if more than one rate plan). When you go into the app, it will automatically go to the plan and line that you logged in under. To find other lines on the account, go back to the main menu. When looking for another user, the main menu will show "All Plans/All Lines" as well as the different rate plans on the account. Tap on the specific rate plan to narrow down your search. Once you tap on a specific rate plan, you will be able to view by line. The progress bars give a quick representation of your estimated usage vs. monthly plan amounts. The bars will change color depending on how close to the plan amounts you are for the billing cycle. Green bar means you are within your monthly plan limit and should have nothing to worry about. A full green bar means you have an unlimited amount. Yellow bar means you are at least 80% of the plan amount for the month. Red bar means you have hit the plan amount for the month and are incurring additional charges. Above the progress bar is the numerical representation for the estimated usage and monthly plan amounts. If the monthly plan amounts are shared among all lines on your account, it will provide your usage denoted as myUsage, the account usage and the monthly plan amount. Yellow bar means you are at least at 80% of the plan amount for the month. To get more detail on your Talk, Text and Data usage, from the main menu screen, tap the progress bar or the grey arrow on the right hand side. Just like the main menu screen, there are progress bars and actual number information displayed for each. I am on a family account. Will the usage information that is displayed be fore my mobile number or for the entire account? If you share, the usage bar will show a two tone bar with your usage and the cumulative usage of all lines on the account. Above the progress bar is the numerical representation for the estimated usage and monthly plan amounts. If the monthly plan amounts are shared among all lines on your account, it will provide your usage denoted as myUsage, the account usage and the monthly plan amount. I have reached my monthly plan allotment on talk, text or data, but I did not receive a notification. Why? In the myNotifications screen, tap On by notifications and select who should receive text messages and email messages. You will now receive usage notifications when you are approaching or go over plan amounts. How do I make a payment on the myCellcom app? To make a payment, from the main menu screen, tap Make a Payment. The initial myPayment screen provides current balance information. To continue, tap Make Payment. To pay with a credit card, tap Pay with Credit Card under Payment Information. Fill in the requested information. The app preselects paying the account balance, but you can change that to just pay the past due amount or a specific amount. When complete, tap Continue. Confirm the information is correct, then tap Submit Payment. Next, you will go to the successful payment screen letting you know that your payment was successfully posted to your account. Tap Done to go back to the main menu. To make a payment with a checking or savings account, from the myPayment screen, tap Pay with Checking or Savings Account. Select if you are paying with Checking or Savings. Fill in the requested information. The app preselects paying the account balance, but you can change that to just pay the past due amount or a specific amount. When complete, tap Continue. Confirm that the routing number, account number and payment amount is correct and tap Submit Payment. Next you will go to the successful payment screen, letting you know that your payment was successfully posted to your account. Tap Done to go back to the main menu. Please note that your payment may not reflect until your next billing cycle. 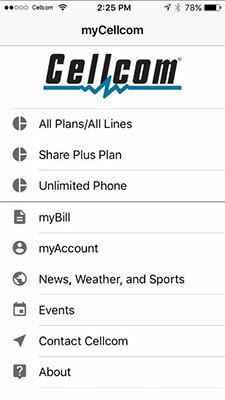 How do I view my plan on the myCellcom app? To view your plan information, from the main menu screen tap My Plan. All plans for the account will appear. Choose the plan you want to view by tapping in it. All lines on the plan chosen will appear. 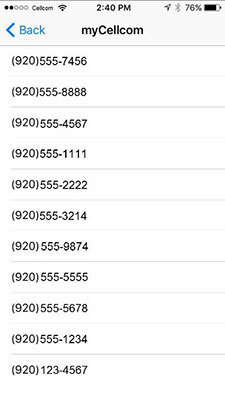 Tap a specific wireless number for plan information. The myPlan page provides an overview of the rate plan and features for each wireless number on an account. Note: Wireless Users will only be able to view their wireless number. How do I view my bill on the myCellcom app? To view invoice information, from the main menu screen, tap My Bill. The myBill page provides an account summary, balance/payments received and current charges and credits. Note: Wireless Users will only be able to view their portion of the bill. Do I have to be the account owner to refer customers to Cellcom? Any MDN with an eligible myCellcom account can refer someone to Cellcom using their referral code. Login to your myCellcom account and click on the "myReferrals" tab to share your unique code with friends and family. Why can't I view the myReferrals tab under myCellcom account? Please check to see if you are eligible to participate in the myReferrals program. Advance Pay PayGo customers, employee, and business accounts are not eligible to participate in the online referral program. If you are a business customer, please contact your local Cellcom representative to discuss our business referral program. Where do I go to set Usage Controls in the myCellcom app? 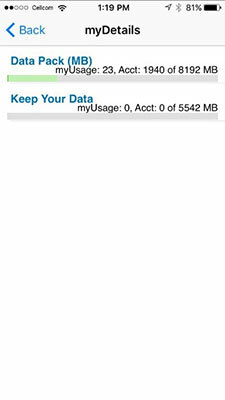 To access the Usage Control functions within the myCellcom app, after logging into the account, tap on the "More" button. 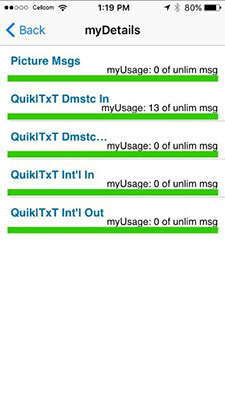 Here you will be able to set Usage Blocks for data, text or talk or set Usage Limits (paid feature). 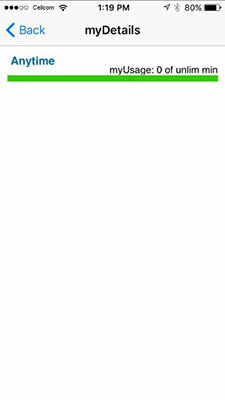 How do I schedule a Usage Block on the myCellcom app? To schedule a Usage Block, after logging into the account, tap on the "More" button and choose Usage Blocks. This will bring you to the Set Usage Blocks screen. Here you will be able to block data, text or voice services immediately by tapping on the sliding bar or you can schedule a date for the services to be blocked by tapping on the Schedule Block Dates sliding bar and entering a start and end date. How do I set Usage Limits on the myCellcom app? To schedule Usage Limits, after logging into the account, tap on the "More" button and choose Usage Limits. This will bring you to the Set Usage Limits screen. Here you will be able to enter the amount of data you want to allocate to the line by tapping on the sliding bar and entering the amount of data you would like to limit. You can also select what to do when the line reaches its data usage limit. Either leave the sliding bar at Notify Only or tap the sliding bar to change to Notify and Block the line that is approaching its allocated limit. How do I increase my data bucket size on the myCellcom app? On the main plan screen, tap on the more options icon, then "Increase Data Plan". You will then be taken to a screen where you will be able to choose from different shared data options along with the duration of months you would like to continue with the increased data option. Once you have chosen the data amount and duration of time, tap on "Ok" or "Save". How will I know my data increase went through on the myCellcom app? Once you submit your changes, you will then receive a data increase confirmation. Read through the text and tap on "cancel" if you would like to go back or "submit" if you agree with the terms and would like to proceed with your data increase. How do I sign up for a myCellcom account via the myCellcom app? To sign up for a myCellcom account, tap on "sign up" on the log in screen. Enter your 10 digit wireless number. Select whether you want your temporary password sent to you via text or mailed to your billing address. Next select if you want to sign up as a "wireless user or an "account owner". If you choose to proceed as an account owner, you must either enter your account password, last 4 digits of your social security number, or the last 4 digits of your tax ID number. Can I request a temporary password via the myCellcom app if I have forgotten mine? Yes. Simply tap on "forgot password" on the log in screen. Next, enter your 10 digits wireless number and choose whether you want your temporary password sent via text or mailed to your billing address. Enter in your account password, last 4 digits of your social security number, or the last 4 digits of your tax ID. Once you have completed all this information, you will receive a confirmation message.